Connelly’s Softball team competes in the Express League. Our athletes are competitive and consistently make the All- League honors teams. Home games are held on our own CIF regulation Sullivan-Henry Athletic Field. 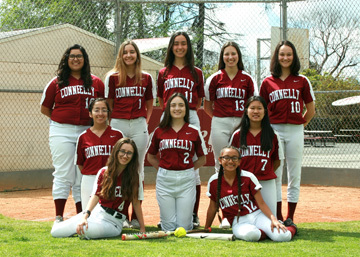 Softball tryouts are February 7, 2019, from 3:15-5 p.m. at Connelly. February 20 @ home vs. Capistrano Valley Christian 3 p.m.
February 21 @ home vs. La Sierra Academy 3 p.m.
March 1 @ home vs. St. Pius Matthias 3 p.m.
March 18 @ home vs. Summit View 3 p.m.
March 20 @ Brethren Christian HS 3:15 p.m.
March 22 @ home vs Southlands Christian 3 p.m.
March 26 @ Gladstone HS 3 p.m.
March 27 @ Riverside County Education Academy @ 2:30 p.m.
March 29 @ home vs Calvary Chapel Downey 3 p.m.
April 2 @ Bastanchury Park vs. Eastside Christian 2:30 p.m.
April 4 @ home vs Saddleback Valley Christian 3 p.m.
April 9 @ Carolyn Rosas County Park vs. Southlands Christian 3 p.m.
April 10 @ Cook Park vs. Saddleback Valley Christian 3:15 p.m.
April 15 @ Calvary Chapel Downey 3 p.m.
April 17 @ home vs Eastside Christian 3 p.m.